In Part II, I alluded to systemic conditions inherent to contingency recruiting that can incentivize bad behavior. Before proceeding with warnings about recruiters, let’s provide some context as to why some recruiters behave the way they do. Agency recruiters (AKA “headhunters”) that conduct contingency searches account for most of the recruiting market and are subsequently the favorite target of recruiter criticism. These are recruiters that represent multiple hiring firms that pay the recruiter a fee ranging anywhere from 15-30% of the new employee’s salary. This seems a great deal for the recruiter, but the downside of contingency recruiting is that the recruiter may spend substantial time on a search yet earn no money if they do not make the placement. Contingency recruiters absorb 100% of the “risk” for their searches by default, unlike retained recruiters who take no risk. Hiring companies can establish relationships with ten or twenty contingency firms to perform a search, with each agency helping expand the company’s name and employer brand, yet only one (and sometimes none) is compensated. When we combine large fees with a highly competitive, time-sensitive demand-driven market, the actors in that market are incentivized to take shortcuts. Please don’t confuse these revelations as excuses for bad behavior. Recruiters who either do not understand or choose to ignore industry ethics make it much more difficult for those who do follow the rules. I provide these warnings to expose problems in a secretive industry, with hopes that sunlight will serve as disinfectant. All recruiters won’t act this way. Many will. Keep these things in mind when interacting with your recruiter. Your recruiter may send your résumé places without your knowledge – To maximize the chances of getting a fee or to utilize your desirable background as bait to sign a prospective client, recruiters may shop you around without your consent. This only tends to cause issues when the recruiter sends your résumé somewhere that you are already interviewing. REMEDY: Insist that your recruiter only submits you with prior consent (in writing if that makes you feel more comfortable). Your recruiter may attempt to get you as many interviews as possible, with little consideration for fit – This sounds like a positive until you have burned all your vacation days and realize that over 50% of your interviews were a complete waste of time. This is the “throw it against the wall and see what sticks” mentality loathed by both candidates and employers. REMEDY: Perform due diligence and vet jobs before agreeing to interviews. If you reject a job offer, the recruiter may take questionable actions to get you to reconsider – No one can fault a recruiter for wanting to promote their client when a candidate is on the fence. That is part of the recruiter’s job. Recruiters cross the line when they knowingly provide false details about a job to allay a candidate’s fears. A recruiter may call a candidate’s home when the recruiter knows the candidate isn’t there in an attempt to speak to and get support from a spouse or significant other. The higher the potential fee, the more likely you are to see these tactics. REMEDY: If you have questions about an offer that don’t have simple answers, such as inquiries about career path or bonus expectation, get answers directly from the company representatives. When your decision is final, make that fact clear to your recruiter. If you accept a counteroffer, the recruiter will attempt to scare you – Counteroffers are the bane of the recruiter’s existence. Just as the recruiter starts counting their money, it’s swiped at the last possible moment – and just because the candidate changed their mind. Recruiting is a unique sales job, in that the hire can refuse the deal after all involved parties (employer, new employee, broker) have agreed to terms. Sales jobs in other industries don’t have that issue. When a counteroffer is accepted, expect some form of “recruiter terrorism“. In my opinion, this is perhaps the most shameful recruiter behavior. Recruiters have been known to tell candidates that their career is over, they will be out of a job in a few months, and that the decision will haunt them for many years to come. All of those things may be true in some isolated instances, but plenty of people have accepted counteroffers without ill effects. I’ve written about this before, as it’s important to understand the difference between the actual dangers of counteroffer acceptance and the recruiter’s biased perspective. REMEDY: Consider any counteroffer situation carefully and do your own research on the realities of counteroffer, while keeping in mind the source of any content you read. You will be asked for referrals, perhaps in creative ways – Recruiters are trained to ask everyone for referrals. This was much more important before the advent of LinkedIn and social media, when names were much more difficult to come by. Candidates may expect that recruiters will ask “Who is the best Python developer you know?”, but they may feel less threatened by a recruiter asking “Who is the worst Python developer you know?”. Again, we shouldn’t blame recruiters for trying to expand their network, but if the recruiter continues to ask for names without providing any value it’s clearly not a balanced relationship. REMEDY: Give referrals (if any) that you are comfortable providing, and tell the recruiter that you’ll keep them in mind if any of your associates are looking for work in the future. Whether you act on that is up to you. If you list references they will be called (and perhaps recruited) – When a candidate lists references on a résumé, it’s an open invitation to recruit those people as well. If your references discover that you leaked their contact information indiscriminately to a slew of recruiters and that act resulted in their full inbox, don’t expect them to volunteer to serve as references in the future. REMEDY: Never list references on your résumé. Only provide references when necessary, and ask the references what contact information they would like presented to the recruiter. You will receive continuous recruiter contact for years to come, usually more often than you’d like – Once your information is out there, you can’t erase it. Don’t provide permanent contact details unless you are willing to field inquiries for the rest of your career. REMEDY: Use throwaway email addresses and set guidelines on future contact. Recruiters get paid when you take a job through them, regardless of whether it’s the best job choice for you – This is a simple fact that most candidates probably aren’t conscious of during the job search. There are three potential outcomes – you accept a job through the recruiter, you accept a job without using the recruiter, or you stay put. Only the first outcome results in a fee, so the recruiter has financial incentive first to convince you to leave and then to only consider their jobs. What type of behavior does this lead to? Recruiters may ask you where you are interviewing, where you have applied, and what other recruiters you are using. Some may refuse to work with you if you fail to provide this information. They may provide some explanation as to why this information is vital for them to know, but the reason is only the desire to know who they are competing against and to have some amount of control. The more detail you provide, the more ammunition the recruiter has to make a case for their client. REMEDY: Always consider a recruiter’s advice, but also consider their incentives. Provide information to recruiters on a need to know basis and only provide what will help them get you a job. Specifics about any other job search activity are private unless you choose to make it known. Recruiters have almost no incentive to provide feedback – Many job seekers wonder why agency recruiters often don’t provide feedback after a failed interview. 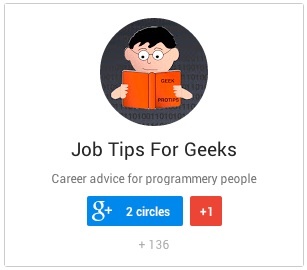 Of my 60+ articles on Job Tips For Geeks the most popular (based on traffic coming from search engines) is “Why The Recruiter Didn’t Call You Back“, so it’s clear to me that this is a bothersome trend. Once it becomes clear that you will not result in a fee, your value to the recruiter is primarily limited to the possibility of a future placement or a source for referrals. Interview feedback is valuable to candidates, and job seekers that commit to interviews deserve some explanation as to why they were not selected for hire. REMEDY: Set the expectation with the recruiter that you will be interested in client feedback, and ask for specific feedback after interviews are complete. Once you have identified the recruiter(s) you are going to use in your job search, it is ideal to immediately gather information from the recruiter (and provide some instructions to the recruiter) so expectations and boundaries are properly set. All recruiters are not alike, with significant variation in protocol, style, and even the recruiter’s incentives. The stakes are high for job seekers who entrust someone to assist with their career, but it’s important to keep in mind that a recruiter stands to earn a sizable amount when making a placement. For contingency agency recruiters who make up the majority of the market, the combination of large fees and competition can incentivize bad behavior. More on this in Part III. As a recruiter, I find that transparency helps gain trust and is necessary to establish an effective professional relationship. Candidates should realize that I have a business and profit motive, but I also want my candidates to understand my specific incentives so they can consider those incentives during our interactions. The negative reputation of agency recruiters makes this transparency necessary, and honest recruiters should have nothing to hide. Some recruiters will be more open than others, and the recruiter’s willingness to share information can and should be used as potential indicators of the recruiter’s interests. A recruiter must be able to articulate their own incentives, and be willing to justify situations where full transparency is not provided. To establish boundaries and set expectations, there are several topics that need to be addressed. The recruiter’s experience – Hopefully you vetted your recruiter before contact, but now is the time to verify anything that you may have read. Confirm any claimed specialties. How the recruiter is paid for any given client – Whether or not recruiters should reveal their fee percentages is debatable, but job seekers certainly have the right to know how fees are calculated. Why is this important? Some fees may be based on base salary only while other agreements may stipulate that a fee includes bonuses or stock grants. If the recruiter is providing advice in negotiation, it’s helpful to know what parts of the compensation package impact the recruiter’s potential fee. Keep in mind that recruiters often have customized agreements with their clients. When a recruiter is representing you to multiple opportunities, it’s absolutely necessary for you to be made aware of each client’s fee structure. If you sense that your recruiter is pushing you towards accepting an offer from Company A and discouraging you from a higher offer with Company B, knowing who pays the recruiter more helps temper the advice. The recruiter’s relationship with any given client – Did the recruiter just sign this client last week or do they have a ten year history of working together? Has the recruiter worked with certain employees of the client in the past? This information is primarily useful when considering a recruiter’s advice on hiring process and negotiation, as the recruiter’s familiarity (or lack thereof) could be a contributing factor to getting an offer and closing the deal. The recruiter should also be willing to share if the client is a contingency search or retained (some fee paid in advance). This information has little impact on incentives, but clients do have a vested interest in hiring from a recruiter on retainer as they already have some skin in the game. As much detail as possible on any given job being pitched – Some candidates are satisfied with only knowing a job title while others want to know whether a company has a tendency to hire executives from outside or within. Recruiters will have some specific details, but candidates should expect to perform a bit of due diligence as well. If there are certain deal breakers regarding your job search (maybe tuition reimbursement is a requirement for you), it’s the candidate’s responsibility to convey those conditions and the recruiter’s responsibility to clear those up before starting the process. How and when to contact – If you share all your contact information with a recruiter without instruction, many recruiters will assume they have full access. Recruiters want to establish a solid relationship and may feel the best way to do that is through extensive live contact. An inordinate number of calls to your mobile phone during office hours could tip off managers to your search, which may even benefit the recruiter’s efforts to place you. Set guidelines on both method and time acceptable for contact. No changes to the résumé without consent – I hear this complaint often, and the solution for many is a PDF. The most common change made is the addition of the recruiter’s contact info and maybe a logo. This is harmless, and designed to ensure that the recruiter gets their fee if the résumé is found three months later and the candidate is hired. There are many anecdotes about recruiters adding or subtracting details from a résumé, which is a different story. It’s entirely unethical for a recruiter to insert skills or buzzwords without consent. No résumés submitted without permission – To prevent a host of potential issues, be explicit about this. A recruiter who is not given this directive may feel they have carte blanche and might submit your résumé to a company you are already interviewing with, a former boss you didn’t like, or any number of places you don’t want your résumé going. Need to provide client names before submittal – See above. There are somewhat unique scenarios where companies request anonymity before they establish interest in a candidate, but these are extremely rare cases. It is not only important to know that your résumé is being sent out, but also where it is going. Only want to be pitched jobs that meet your criteria – This is more about saving time than anything else, but contingency recruiters playing the numbers game may try to maximize their chances of making a fee on you by submitting you to every client in their portfolio. The result is wasteful interviews for jobs that you are unqualified for or that you would never have accepted in the first place. Recruiters aren’t mind readers, so you’ll need to be specific. If you are limiting your search to specific locations and types of jobs, establish those parameters early and ask to be informed only about jobs that fit. Expectation of feedback, preferably actionable – One of the biggest complaints about recruiters is that they suddenly disappear after telling you about a job or sending you on an interview. There are multiple reasons for this, some understandable and others less so. Asking the recruiter when you should expect to hear feedback and sending prompt emails after interviews should help you gather valuable information about what you are doing well and where you could use some work. Recruiters don’t want to hurt a candidate’s feelings and may filter their feedback, but the raw information is more useful and often actionable. Ask for a low level of filtering. Follow this blog (see right margin) or @jobtipsforgeeks on Twitter to receive notifications about new posts, including Part III of this series. This week I read an unusually high number of articles (and the comments!) about recruiting. Although most of the discussion quickly turns to harsh criticism, there are always a few people wondering the best ways to find a decent recruiter to work with and what to do once they have established contact. Some recruiter demand stems from candidates looking to relocate into areas where they have no network, while others just want to maximize their options and feel they may benefit from the services provided by an agency recruiter. Regardless of your reasons for seeking out an agency recruiter, first you have to find one. There are three reliable methods to getting introduced to a recruiter. This is the best method for most, as being introduced by a contact can have unexpected benefits. To maximize those benefits, you must consider the source of your referral. If the recruiter has a great deal of respect for the person introducing you, you are likely to be given some immediate credibility and favorable treatment due to that association. Unfortunately the alternative is true, and if you are referred by someone the recruiter does not respect it may be assumed that you are not a strong talent. When asking for recruiter referrals it is wise to start with the most talented people in your network. Your network does not have to be the only source of referrals, particularly if you are looking for a recruiter in an area where you have no network. User group and meetup leaders are frequently contacted by recruiters and one should expect group leaders to be knowledgeable of the local market. Even a random email to an engineer in another location could result in a solid lead. If I had a nickel for every time I heard technologists complain that they aren’t hearing from enough recruiters, I’d be poor – though some voice frustration that they don’t hear from the ‘right ones‘. Increasing your visibility will attract recruiters who may or may not be the ones you’d want, but it helps establish a pool for evaluation to choose who is worthy of a response. To maximize your chances of being found and contacted, you need to consider how recruiters will find you. The obvious place is LinkedIn, and spending a few minutes fixing up your profile will help. Keywords and SEO concepts as well as profile ‘completeness’ should be your focus. (further reading on this) Recruiters are likely to be searching for combinations of keywords from their requirements, usually with some advanced search filters based on location, education, or experience. Completeness matters. Some recruiters search Twitter and the other standard social sites as well. If you have a profile anywhere, just assume that a recruiter might find it and optimize keywords similarly. Keep in mind how easy or difficult it is for people to contact you once you’ve been found. Just because I see your LinkedIn profile or Google + account doesn’t mean I can contact you. Many professionals create an email address (maybe currentemail-jobs@domain) strictly for recruiter correspondence and include it in their LinkedIn profile and other social pages. Another option is to get discovered on job search sites like Indeed, Monster, and Dice. These are frequented by active job seekers, and some recruiters may view your posting there as a somewhat negative signal. Be warned that posting personal information on these sites means that those phone numbers or email addresses will live forever in the databases of recruiters everywhere. PROTIP: Those that complain about recruiters often cite laziness in the initial contact. This may be evidenced by an obvious cut and paste or clear signs that the recruiter didn’t read the bio. If you want to screen out recruiters that don’t do the work, put up a barrier to weed out the lazy. This page that uses scripts in Python and Haskell to hide an email address is perhaps my favorite, but there are other less clever ways if you want to set the bar lower than the ability to cut/paste code into a compiler. Recruiters search for you, and you can search for them. Most recruiters are going to be easiest to find on LinkedIn due to the amount of time they spend there. 2 – On the upper left side of your screen you will see several fields. Make sure you are doing a People search (and not a Jobs search). 3 – Type ‘Recruiter’ and other terms specific to you in the Keywords field. Try ‘developer‘ or ‘programmer’ and a term that a recruiter might use to brand you, such as a language. Recruiters often populate their LinkedIn profiles with the technologies they seek, not unlike job seekers trying to catch the automated eye of a résumé scanning system. 4 – Enter the zip code of the area where you wish to find work and consider setting a mile limit. Some recruiters work nationally, but local knowledge goes a long way if you are seeking to work in one area. Once you start entering the code, a menu appears. Depending on where you live, you may want to select 25 or 50 miles (probably good for northeast or mid-Atlantic US), or up to 100 miles (for midwest). 5 – On the right, make sure you have 3rd + Everyone Else checked under Relationship. This will maximize your results, particularly if your LinkedIn network is small. 6 – Click Search. Repeat, and vary the words you used in Step 3. You should see a few different faces as you adjust the keywords, and you’ll also see whether you have connections in common with those in your search results. Twitter is another decent option. Make sure you are searching People (and not Everything), and pair up the word recruiter with some keywords and/or geographic locations. You’ll get numerous hits in most cases, and should only have to do a bit of legwork to find their bios. In addition to being able to find recruiters on social sites, you can use job boards as well. If you search for a Ruby job in New York City, you may quickly find that several of the listings are posted by one or two recruiting companies. Look into those firms to see if they have a specialty practice. Search engines might be a bit less useful and are likely to turn up the same listings found on job boards. Once you have found a pool of potential recruiters, you need to decide which ones to contact. Most job seekers want a recruiter that can provide quality opportunities, has deep market knowledge, can leverage industry relationships, and will navigate issues in the hiring process. What criteria should we use in the evaluation? Just like most disciplines, in recruiting there is no substitute for experience. It takes time to develop contacts and to learn how to uncover potential land mines. Extensive education, recruitment certifications, and training programs don’t get you a network or prepare you for handling unique situations. Early in my career I know I made many of the mistakes that technologists complain about, and I didn’t have a solid network or steady clients for at least five years. At a certain point in your recruiting career you may not have seen it all, but it’s rare that you are surprised by an outcome. Experienced recruiters that have spent little time in the industry may be good for general job search advice or negotiation, but can’t provide full value. Look for a consistent track record of years in your field and geography of your search. Talking to a few generalists will make the specialists stand out. Since recruiters aren’t paid by you and differ from a placement agency, it’s important that the firm has client relationships. Most firms do not advertise their client names which can make it difficult to discover the strength of an agency’s opportunities. The descriptions themselves could be enough to convince you that the agency has attractive clients. Agencies with solid relationships may reach out to past clients and contacts when they don’t have a position that is a clear fit for your background. Being that an agency recruiter is going to be representing you to companies and even advocating and negotiating on your behalf, it’s important that you get along. You don’t need to be best friends, but someone who dislikes you is unlikely to fight for your best interests. A ten minute call should give the insight you need to make the decision. Ask questions about their experience and pay attention to the types of questions they ask you. If they don’t dig into your goals and objectives, they probably aren’t concerned with finding a good fit for you. The decision to join a new employer and the process leading up to the move can be fraught with emotional attachments, irrational fears, and incomplete information. Since job searches in technology often include self-interested third parties of varying influence (e.g. recruiters, founders, hiring managers) acting within a highly competitive hiring environment, the job seeker can be pushed and pulled in several directions, sometimes based on half-truths and distortions. The result of the job change (or the decision to refuse an offer and stay put) in many circumstances is buyer’s remorse, where regret can be felt rather quickly. First let’s look at the more common reasons that candidates regret taking a new job, and then explore one rather simple solution to avoid the mistake. You would need to be blind not to notice that tech recruiting firms are now tending to hire young and attractive female rookie recruiters, which is an obvious strategy (similar to the so-called “booth babes” at trade shows) to get the attention of the predominantly male tech audience. Some of the LinkedIn recruiter profile photos border on racy, and perhaps sad. I should confess here that I too use a LinkedIn profile photo, which is probably best described as smug (included below, for science). Since I started blogging I have been regularly approached by readers living hundreds of miles away asking if I know a recruiter in their geography that might be able to help them find new work. For every ten people that hate on recruiters, there are at least a couple that see value. Many tech pros complain that they are only being approached by the aforementioned 22 year old crowd with an average six months of recruiting experience, sending canned messages with a pretty LinkedIn profile photo. How much solid career advice can you get from a new liberal arts or PE grad who was waiting tables until a couple months ago? Very little, and I should know – because that was me 15 years ago (except Economics and bartender). I deal with internal recruiters that work at my client companies, but readers want intros to people who do what I do. These internal recruiters only represent their company, whereas agency recruiters like me can provide several job opportunities. Instead of just replying with “Sorry, I don’t really know anyone in your area”, I thought I’d provide some thoughts on methods to find someone you will want to work with in your job search.